The enormous rhomboidal steel skeleton structure with its storeys flanked by green outdoor terraces ensures a unique look for the façade and offers a fantastic view of the Mumbai region. 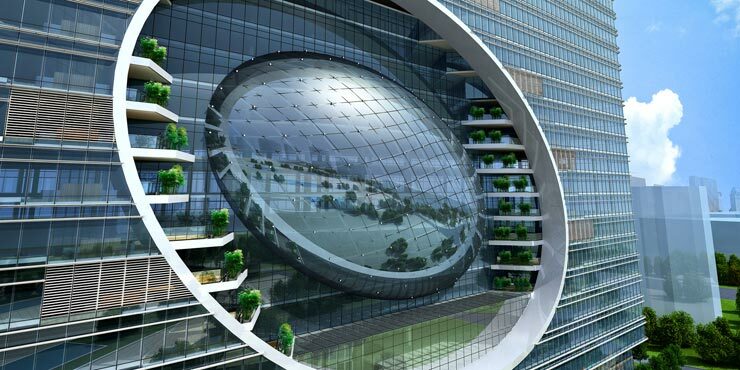 The 19-storey, high-tech, freestanding building is called “The Capital” and is setting new standards for sustainable office buildings thanks to its striking elliptical glass façade element. The groundbreaking design of the building shell with integrated, intelligent environmental technologies and a transparent, highly insulated double glass façade optimises the overall energy efficiency by roughly 35 per cent as compared to conventional office buildings – due to the simultaneous maximum use of daylight, optimised fresh air management and the treatment of waste water and rainwater without creating sewage. The sanitary facilities equipped with innovative GROHE technology also offer the highest level of sustainability, efficiency and design on every floor. The resource-conserving, durable GROHE products ensure the best-possible hygiene conditions with minimal water consumption in the washroom facilities.